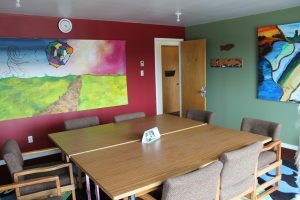 The Chibougamau Eenou Friendship Centre Conference Room can be rented at reasonable cost by members of the community and guests. In its regular configuration, the room seats eight (8) comfortably but can be expanded to seat twelve (12) people. Equipment for telephone conferences is available upon request. In addition, it is possible to order coffee breaks and snacks at a competitive price.